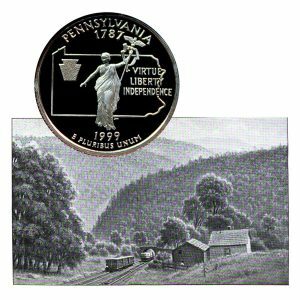 Today, the Pennsylvania State Quarter Coin remembers when the Allegheny Portage Railroad opened the tunnel for business on March 18, 1834. Next to the viaduct, the tunnel at the Staple Bend of the Conemaugh, 4 miles east of Johnstown, attracted great attention. It was the first tunnel built in America, and stands (1897) alone amidst the grandeur of the mountains as a silent witness of the deeds performed over 60 years ago by the Commonwealth in its efforts to annihilate distance. It is 901 feet long, 20 feet wide, and 19 feet high within the arch. For 150 feet at each end, its arches were made of cut stone. Its cost was $37.498.84 1/4 cents, and J. and E. Appleton were the contractors who built it. At the period when railroads were introduced into this country, the plans for operating them entered largely into the discussions as to their superiority and usefulness. The weight of popular opinion was in favor of the rules governing turnpike roads and adverse to centering the control of motive power on them either in the agents of the Commonwealth, individuals, firms, or corporations. Monopoly was the bugbear in the dreams of the people, whilst the greatest good to the country was expected to follow giving to each and every individual citizen the largest liberty to roam as a carrier over the railroad at such times and in such a way as would suit his own convenience. It required actual performance to educate the people and demonstrate the fact that good results could only be attained by intelligent administration and executive control of railroads being centered in a proper and absolute authority. Upon opening the first track of the Allegheny Portage Railroad for transportation on March 18, 1834, there were twenty-five (25) cars upon the road ready for use. By the 1st of April these had increased to fifty (50) and on April 15 to eighty (80). This number of cars was entirely inadequate to accommodate the trade offering, and a large quantity of merchandise was carried in wagons from Hollidaysburg to Blairsville, and thence by canal to Pittsburgh. The transportation was carried on by companies and individuals, who furnished their own cars and horses, the State at that time not furnishing any power. The Western Transportation Company arranged their horses to have three (3) relays between Johnstown and Hollidaysburg. All the other companies and individuals doing a transportation business had relays for their passenger cars, but for their burden or freight cars they used one set of horses to go through. The latter generally made a trip across the railroad and back in three (3) days. the distance traveled being seventy-two (72) miles. The price paid to the owners of horses when hired, was from $1.00 to $1.25 per ton hauled over the railroad, transporters of course furnishing the cars and paying the tolls. The number of horses attached to a train of cars was regulated by the number required to draw them at the steepest grade. On the level parts of the road and when the incline did not exceed 10.25 feet per mile (which was the grade upon the larger portion of the road) the horses hauled less than half a load, and passed up and down the inclined planes without performing any effective labor. By this lack of management, three times as many horses were employed as were necessary. In addition to the increased expenses that this mode of motive power caused, a source of great inconvenience to trade and travel was the delay produced. The laws and independence of the turnpike road governed transporters and drivers. No two persons were willing to start at the same time or travel at the same rate of speed. One would travel at the rate of four miles per hour—another at three. One man would feed his horses at one place, another would go a mile or two further and feed. This caused interruptions at almost every mile. Experience taught the authorities that it was impossible for them to compel the cars to start at a certain time and travel at a fixed rate of speed, when it was left to the convenience or interest of so many persons. So much confusion, complaint and friction was caused by the “do as you please” system, that a decided change took place in popular opinion. This found expression in the act of April 15, 1834, relative to the management of the Philadelphia and Columbia and Allegheny Portage Railroads, which authorized the Canal Commissioners to use locomotive engines, and to make such regulations and appoint such agents as would be necessary to conduct the business. Individuals were allowed the right to place cars on the road, and attach them to the locomotives of the Commonwealth under such regulations as the Board might adopt. Under this authority, the Board, on June 4, 1834, adopted rules and regulations covering those roads. One of these rules and regulations provided that motive power would be furnished by the State as soon as a certain number of locomotive engines could be procured, that such engines would be used as motive power on all parts of the road where they could be advantageously employed. Another provided that locomotive engines with their trains should start from their respective stations periodically and move with uniform speed. Those drawing cars containing the United States mails and passengers were allowed to move at a rate of speed not exceeding 15 miles, and those drawing burden cars not exceeding 10 miles per hour, except when passing bridges or over viaducts, when the speed was to be reduced as might be directed by the principal engineer. Individuals or companies were permitted to use horses to be driven tandem as a motive power, until such time as notice was given them by the principal engineer of the line that the Commonwealth would furnish power. Two weeks after such notice transporters were prohibited from further use of horses to the extent of the power thus furnished. In operating the road, trains drawn by locomotive engines were given the preference over horses and the description of traffic hauled had preference in the following order: First, United States mails; second, passengers; third, burdens. The application of the rules caused considerable opposition and was a source of agitation immediately preceding the fall elections and before the convening of the Legislature. Engineers of stationary engines, $1.50 to $1.68 3/4 per day. Assistant engineers of stationary engines, $1.00 to $1.25 per day. Fireman of stationary engines, 87 1/2 cents per day. Car tender, 75 cents per day. The latter attached and detached the rope from the car. There was also a principal rigger who had charge of all the ropes. He received $2.00 per day, and his assistants, of whom he had several, $1.12 1/2. The toll sheet was simple and provided a charge of one cent per mile for each freight car passing over the road, and when loaded an additional charge equal to double the amount per mile of tolls charged on the canal for the same articles. On each passenger car, the charge was two cents per mile, and one cent per mile additional for each passenger over 12 years of age, and one-half cent per mile for each passenger between the ages of 6 and 12 years. These charges were for the use of roadway only. The revolution that the completion of this road made in the cost of transportation is shown in the fact that immediately prior to that event it cost from $12.00 to $16.00 per ton to transport merchandise from Hollidaysburg to Blairsville, a distance of 53 miles, whereas, upon the completion and by the use of the road, the cost for the same service, whilst consuming less time, fell below $4.00 a ton. The Pennsylvania State Quarter Coin shows with an artist’s image of the first railroad tunnel that began operations on March 18, 1834.